Byrd and Holden went scouting ahead. They circled the parameter of the craft and Holden came back at a run. They found Byrd standing over one of them when they arrived. He, she, or it was still holding some sort of device in the left hand. “The bodies are in the same shape as the others. Mummified. Clothing’s held up pretty well. Must be pretty tough to withstand a century out in the open. They all felt the tremor and heard a sound like distant thunder. “What is it, Byrd?” Ashe walked over to him. Murdock bent down over the one holding what…a weapon? “Yeah, the coloring of this suit matches the ones we found in the other craft and the one I wore back in the Ice Age.” Ross then walked over to Byrd and crouched down next to the body he was standing over. Fox chuckled at Byrd’s use of the old meme. He reached inside his cloak. Byrd and Murdock walked over to him while Holden kept watch and Fox looked more closely at one of the bodies. “Locking mechanism. This should be the key.” Ashe inserted the piece of Forerunner technology into the “lock” on the strut. It fit but then nothing happened. “No wait, Ross.” Ashe manipulated what looked like a virtual dial and some buttons on the device trying different combinations. When that didn’t yield results, he pulled a more terrestrial but still mysterious device from the pouch at his belt. “Hush, Ross.” Ashe applied the second device on top of the first and softly pressed the power button. Nearly half a minute later, the “lock” on the landing strut lit, sounds of a system powering up and then mechanical noises occurred. Holden and Fox turned to see the hatch opening up and a ramp being extended. Ashe, Murdock, and Byrd ran out from beneath the ship to see for themselves. “It’s as good a method of discrimination as any, Ross. We’ll call them ‘blue’ and ‘orange’ to tell them apart until we get a better way of naming them.” Ashe found himself hoping one of the things they’d learn from this ship was the Forerunner language. The trio looked to see Fox and Holden standing at the foot of the ramp the ship had automatically extended. “Coming, Travis,” Ashe called and walked with his two companions to join the two others. This time Ashe started to lead the way when Byrd stopped him. Byrd and Holden, Travis was wondering if they even had first names, cautiously walked up the ramp. 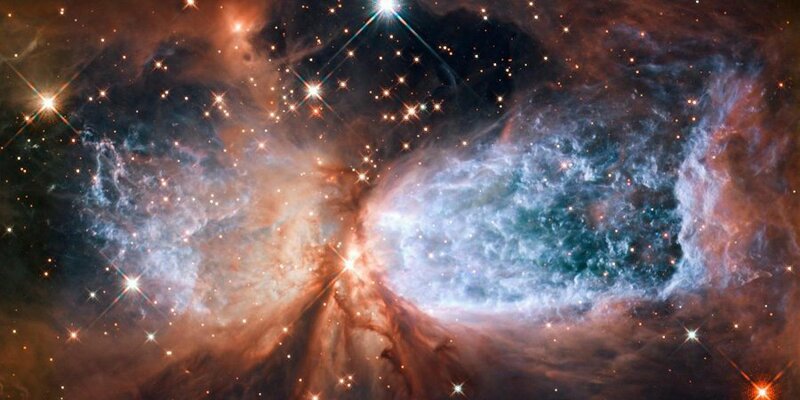 As they approached the threshold of the open hatch, they could see lights come on inside. Two or three minutes passed, then Byrd returned to the edge of the hatch. Ashe, Murdock, and Fox walked up the ramp. This time, it was obvious they were in some sort of airlock. Passing through there, they seemed to be in a large room covered with control surfaces, a chair every so many feet between them. That’s when Ross noticed one of the chairs was occupied. It wasn’t apparent at first because the person was sunken back into the gel. It was a Forerunner, what they’d dubbed an “orange”. He was dead but looked much better preserved than the aliens outside. “Guess so, Byrd.” Ashe and Murdock were taking a closer look at the orange. “Don’t touch him, Murdock.” Ashe used “him” as a matter of convention since no manner of determining gender among Forerunners had been established, assuming the concept of gender was meaningful to them. “No elevator, but the alcove off to the left has a ladder.” Byrd waved his hand indicating the open doorway. Byrd led the way up the ladder. After Ashe, Murdock, and Fox joined him, he gave a brief tour of what appeared to be crew quarters and a small mess. “Your guess is as good as mine, Murdock.” Byrd shrugged his shoulders. Ashe admired Murdock’s imagination, but there just wasn’t enough information available yet. Or was there? As amazing as this situation was, Fox still had a tough time believing Murdock had the memories of a Soviet Army officer and an alien uploaded into his brain. On the other hand, he was standing on the upper deck of an alien spaceship over 10,000 years before he was born, and he was with four other men, all dressed like his distant ancestors. By the time they were finished, it was mid-afternoon. The five ran double-time across the valley floor after Ashe made sure the ship was locked up tight. He had the combination now, so getting back in would be a snap. They topped the ridge and decided to go back into the first valley rather than remain exposed by circling around on the high ground. Byrd and Holden each went around opposite ends of a rock outcropping. Then a loud cry and someone bolted out right toward Ashe, Murdock, and Fox. He tried to turn and run, but Byrd and Holden blocked the way. He said words, some sort of speech. Even Ashe had no idea what he was saying. The accidental intruder let go of his spear, dropped to his knees and closed his eyes tight, mumbling rapidly. Byrd was tough but even he thought it was cold blooded to leave a kid alone in this wilderness. The group obeyed Ashe and started walking backward away from the Folsom youth. The kid looked up. He continued talking with his arms out, as if imploring them. As they moved away, they heard the youth yelling at them. Murdock chanced a look back and saw the kid raise his spear as if he were going to throw it at them. He lowered it, glanced in different directions, and then ran off toward where they’d last seen the Bison herd. The time gate was activated for the seventh time for a five minute period, but this time, they got a signal from the other side. The party was returning early. “Prepare for retrieval,” the Control Voice announced. The gate crew moved back and the temporal field erupted as the five time travelers returned from the past. Linden Williams and Koert Verhoeven were the two best volcanologists they could get on such short notice, but they were top notch in their field so Ashe trusted their judgment. Their report wasn’t encouraging. They had no idea what the volcano’s eruptive history was, and although they had installed monitoring equipment, they didn’t have the time necessary to make long term observations. The best they could estimate was one to three months. “That said, it could blow tomorrow or not for another year. You’re asking a lot, Ashe.” Verhoeven spoke in heavily accented English. “Unfortunately, time isn’t something we have. The nature of gate mechanics necessitates synchronized chronology. Now that we’ve jumped, for every day that passes here, a day passes at our target point in the past. “Come on, Linden.” Verhoeven left the cavern with Williams rushing to catch up. “Fun couple,” Travis wryly observed. “Yeah, Ai. I wonder if Williams ever regrets marrying him.” Ross raised his eyebrow as he commented. Other security teams were assigned to Byrd and Holden. They had to make absolutely sure there weren’t more hunting parties or other human groups in the area between the gate and the spaceships. But even if there were, they’d have no choice but to start sending back parts, equipment, and personnel to build the big gate around the “orange” spacecraft. If that one Folsom pre-teen thought Ashe’s party of five was intimidating, he’d have been frightened out of his mind to see large trucks and helicopters appearing out of nowhere and heading west. Ashe was addressing Operation Retrograde’s military commander Major John Kelgarries at the entrance to the cave at what was now called Folsom Base. Kelgarries regarded the shorter man sternly, but he also knew Ashe was rarely wrong. The temporal engineers on site decided they needed to build the gate on the other end in the arroyo’s deep depression, what would eventually erode into a system of caves, back in the Folsom era. The gate was being used so often that the temporal field needed a structure on the other end to create better stability. When they activated the field to link the two gates for the first time, for a few seconds, they got some odd feedback. The large gate was finally finished. It looked like a huge ornate arch stately gracing the Forerunner ship. Samples from the blue ship had long since been transmitted to the present along with the bodies of both the blue and orange dead. The body that had been inside the orange ship was removed along with the gel container. Ashe hoped to learn more about the gel and the person it preserved once this part of the mission was over. Lynn Huỳnh, one of the junior technicians getting the ship’s control systems locked down and ready to time travel was late in her work. 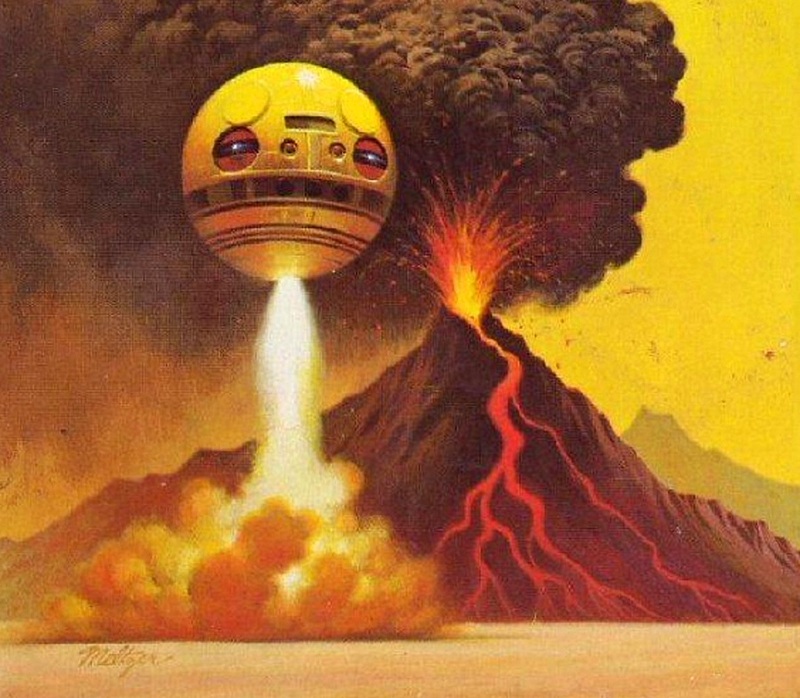 She was responsible for what looked like the secondary propulsion system, but she’d woken up with a migrane, probably the damned smoke from that volcano next door, and she was having a hard time concentrating. Her walkie talkie buzzed and she cursed the fact she was 10,000 years too early for decent cell service. Kiefer Elliott wasn’t bad to work for, but he tended to get testy when under stress. She replaced the radio on her belt and then turned it off. Now if everyone would just leave her alone, she’d be able to get her work finished. Ashe and Murdock were in the main control room, which is what they’d come to think of it, when they heard footsteps coming up the ramp. Travis had reluctantly agreed to stay in the present, but would have the honor of being at the big time gate when their ship came through. “Probably Holden wanting an update.” Ashe got out of the seat he was in, which was amazingly comfortable, but instead of Holden entering through the hatch, another familiar figure appeared. Ross chuckled to himself, thinking it was like they were already married. A large tremor knocked the two of them off their feet. In the next room, Lynn cried out as she dropped her small spanner just as she was finishing the last lock on the controls. They heard and felt an ominous rumbling, then what sounded like a small explosion. “Oh damn. It’s gonna blow.” Murdock found himself looking up and to the right as if he could see the volcano through the ship’s hull. Ashe’s radio came to life. Aiyana was back on her hands and knees and looked at Gordon as if he had just gone insane. Huỳnh had just come out of the auxillary control room or whatever it was. She’d collected her tools and had to grab the doorway as another tremor hit. Ashe was out the door before Murdock could stop him. He made sure Aiyanna and Lynn were secured in the gel seats and then took his own. Ashe wasn’t a gate technician but all active agents were trained in how to operate the controls in an emergency. He paused at the small control panel next to the gate to look up. The sky was almost black. It was hot. The ground kept shaking. It was like watching the end of the world. They’d managed to figure out some of the simpler control buttons and indicators including how to close the hatch from the inside. Murdock’s finger was on panel as Ashe ran in. The ramp was being pulled back into the ship when Gordon sank into red gel. In spite of his panic, he found the gel soothing, relaxing, as if it were acting on his emotions as well as his body. The hatch closed and they could hear the mechanical locking sounds. Another tremor, the largest yet. If only the gate could hold up to the stress for just a few more seconds. Then the four of them felt that odd, disembodied sensation telling them the temporal transfer field had activated. It lasted for just a few seconds but during that time, they had the feeling they were nowhere at all. When it ended, everything was strangely silent. “No volcano,” Ross mused. “We made it.” He pressed the panel to open the hatch but the lit button started blinking rapidly and the hatch remained inert. Then the tremors returned, except they weren’t violent and uneven. Control lights turned on at all of the panels in the room. “They were, Dr. Ashe. I don’t understand it.” Huỳnh felt the pit of her stomach drop to the center of the Earth. She realized she did know why. The volcano’s tremor as she closed the last lock. Something must have slipped. This is an extension of my Time Traders homage, a small collection of chapters honoring Andre Norton’s (Alice Mary Norton’s) 1958 scifi cold war thriller The Time Traders. 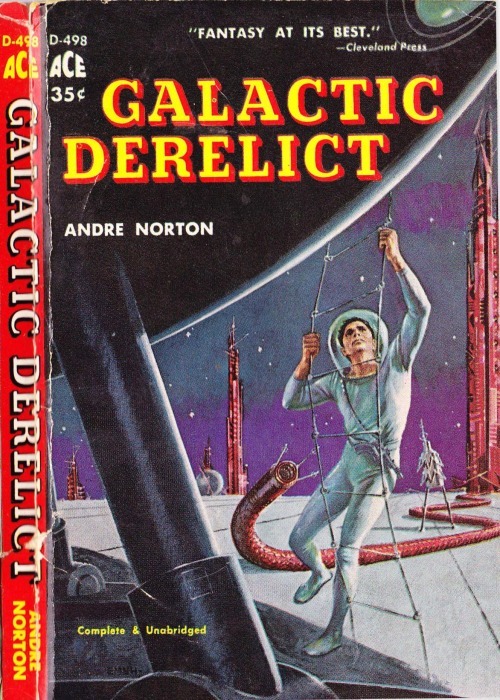 In 1959, she published a sequel called Galactic Derelict which introduced the character Travis Fox. The next chapter is Space Flight.